The Yiddish Expedition in the Ghetto Desert. The Yiddish Engineer Sobel and The Polish Architect Pletchshinski. 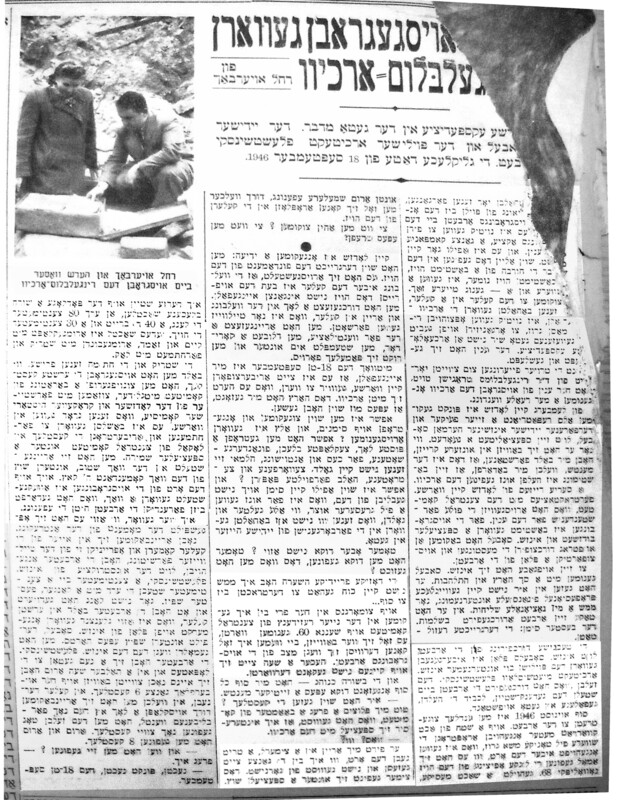 A year and a half has gone by in which some effort was being organized by a whole group to take action for finding and digging up the buried materials in the Desert of the Warsaw Ghetto rubble. Just finding a certain house with a certain number among the rubble was difficult enough. But to find a cellar within a cellar in which the Archive was hidden, it was necessary to lift heavy masses of debris, – to do this in the area that was the ghetto was almost like an archaeological expedition. The matter dragged on and on. Near to the Remembrance Gathering commemorating the second year since Dr. Ringelblum’s tragic death, the matter of digging up the Archive took on a more realistic direction. It happened that a very capable and experienced engineer, Herman Sobel, had returned from Lemberg to Lodz, and as soon as he appeared among us we understood that he was the person we needed who could help find the Archive. The Central Committee was in agreement. A series of trips from Lodz to Warsaw took place with the Central Committee. In a series of meetings it was clear that they understood fully the importance of a special budget in order for Engineer Sobel to do the measurements and to complete a plan for work. Therefore they provided a special budget for him to complete a plan for the work. He undertook the work with much heart and enthusiasm. He saw this work as not an ordinary professional financial undertaking but a national mission and he really followed through on it totally with the best of results. The technical work, according to Engineer Sobel’s plan was delegated to the Polish building engineer and architect, Mietshislav Pleschinski, the same one who had accomplished the work of placing the memorial stone to honor the fallen heroes of the Warsaw Ghetto uprising. At the end of August, 1946, the work was finally begun. In an area of eight quadrant meters, the work started by carrying off many tons of heavy rubble that was heaped in this space, which was once the office of Novolepski 68. Then a large shaft was dug out and several narrower shaft openings were made through which it was possible to let oneself down into the cellars of the house. Will it be possible to get to the necessary place? Will anything be found? A news message came to Lodz. The foundation of the house has now been reached and it appears that not all of it has collapsed in the bombing. They made a hole in the vault and went through to the cellar which was only partly trashed; they put in a pipe for ventilation, they are creating a corridor, supporting it and moving forward slowly. Wednesday the 18th of September I got the idea that it was time for me to go to Warsaw to find out what happened with the Archive. My heart told me that something would have already occurred. Maybe they’ve already found signs that everything had been taken out? Maybe they found an empty hole, damaged tins and out of anger and disappointment, though it’s not gold, damaged emptied tins strewn about with half rotten papers? And maybe there is not a shred left of what for us was a more important treasure than all the money and gold that was hidden in the secret places of Jewish houses in the Ghetto. The next morning early, I arrived at the new residence of the Central Committee on Shenga 60 and started to wait for someone to show up who could tell me the condition of what was dug up in the work. More than an hour passed and no one came. The good news at last was given to me by a passerby. “Have you seen the tin boxes?” Suddenly was asked of me by a member of the committee who knew of my special interest in the Archive. He leads me to a small room near which I have been sitting the whole time and knew nothing. The room is under special guard. I see on the floor a row of tin boxes about eighty cm. long, 40 wide and 30 deep. Every box is covered with clay and sand and tied with a rope and closed with sealing wax. The rope and seals are intact. As soon as the first boxes were dug up, there was a meeting of Lodzer and Cracow historians committee who happened to be in Warsaw at the time and who decided to close all the tin boxes and transport them, under special guard, to the Warsaw Central Committee headquarters. Also at the place where it all was dug up, it was decided there should be a special guard under the command of H. Katz to watch over the opening to the site until everything was finished. I become aware of what happened at the moment of the discovery. After entering the cellar’s partitions, one of the cellar’s partitions and clearing the debris aside, the workers began, according to instructions by Architect Pleshtchinski, to poke the earth with a long firm spike, centimeter by centimeter. It did not take long and right in the first cellar which was beautifully marked in the excellent plan of Engineer Sobel, something hard could be felt. Architect Pleshtchinski was notified about this. The workers took their shovels and within one-half hour they had unearthed six tins. In a nearby cellar, into which one entered through a hole in the still remaining wall, they found two more tins. All in all there were 8 tins. “And when were they found?” I asked.